Our new issue is making its way to mailboxes now. And yep, that’s incoming president Eric Barron on the cover. 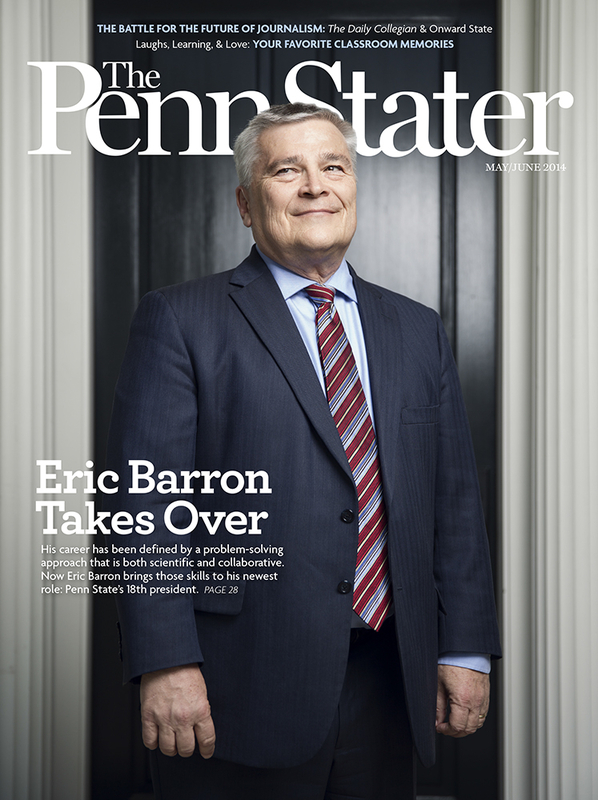 A feature story—for which senior editor Lori Shontz ’91, ’13g made an impromptu trip to sunny Tallahassee in March—offers a deeper look at Barron’s career, his family, his personality, and the leadership style he’ll bring to Penn State when he takes office on May 12. Eric Barron is one of three important presidents featured in the issue: You’ll also find a Q&A with outgoing president Rodney Erickson and a tribute to former president Joab Thomas, who passed away in early March. On the lighter side, there’s a fun collection of classroom memories submitted by readers — who surprised us with both heartwarming and hilarious tales (my personal favorite features a certain Modern Family star). And be sure to check out the quirky and colorful illustrations by talented artist Nigel Buchanan. Another highlight: In “Paper Trail”, writer Brian Raftery ’99 (a contributing editor at Wired) explores the complicated love-hate relationship between The Daily Collegian and Onward State — and what happens when a snarky web startup threatens a 125-year-old Penn State institution. It’s a great read, for sure. Let us know what you think of the May/June issue by commenting below or emailing us at heypennstater@psu.edu. Entry filed under: From the Magazine, The Penn Stater Magazine. Tags: Brian Raftery, Joab Thomas.